Dog dry covered waist unit. 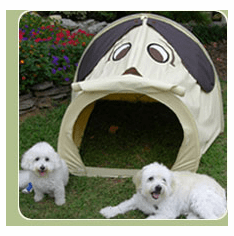 The PoopTentTM This outdoor relief station is a water-proof tent (4' x 4' x 3') which will keep your dogs dry in the rain and snow. The Poop TentTM is hailed by veterinarians as a shelter for sick and injured dogs, as well as dogs who simply don't want to get wet! The Poop TentTM is easy to set-up and disassemble. It has an open bottom with cross ventilation through the front door and back window. Pop open this puppy port-a-potty - right before bad weather strikes - near your dogs' favorite spot. Place some of their waste in the tent to introduce them to its purpose. The Poop TentTM is not a toy and should be kept out of reach of small children.